Bathroom decorations are not really necessary compared to the soap bottles, shampoo or even your toothbrush, but of course, adding decorations in your bathroom spaces are like adding bows to your already beautiful hair. 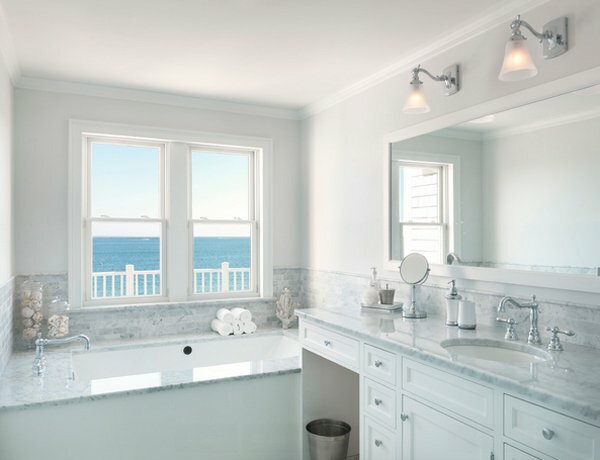 The pictures we have today is a collection of bathroom designs with awesome beach-themed decors. This list includes spaces with designs like star fishes sticking on the walls, turtles pictures, shells on vases and jars, nautical items and so much more. These decorations are inspiring and pretty much interesting to check out because of the wonderful things we have on the beach that we can bring home and put at home without so much expense as much as purchasing these same things on the malls. Check out the list guys! 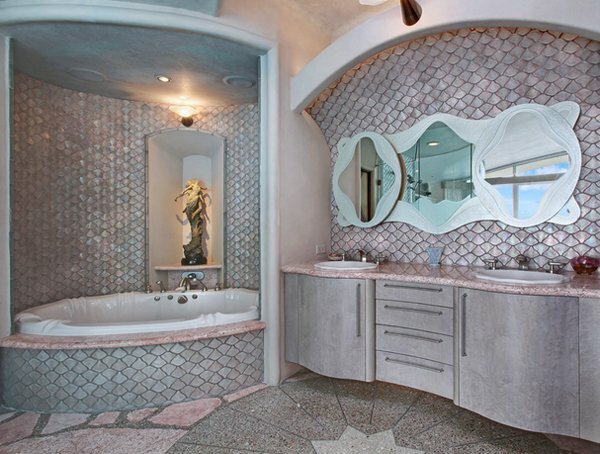 I totally love the psycadelic stonework done in this bathroom. This awesome mirror is just lovely and the walls is just interesting. 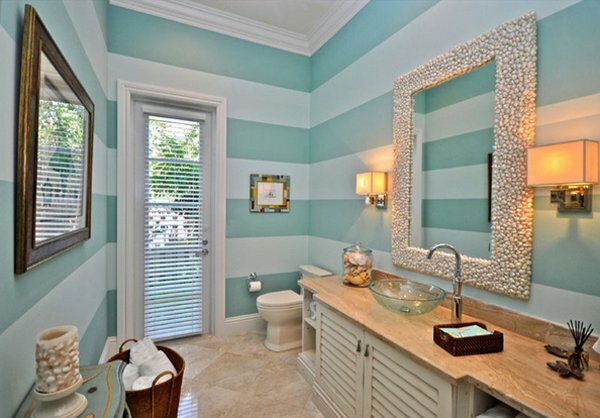 If you want some wow factor in your bathroom, think outside the box, way outside the box. 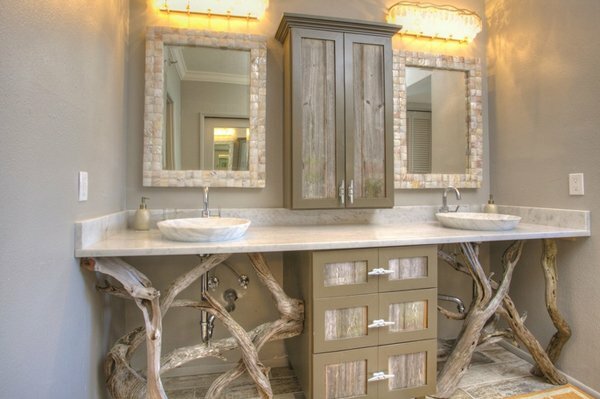 Who would ever think to take branches and turn them into a vanity – we would! 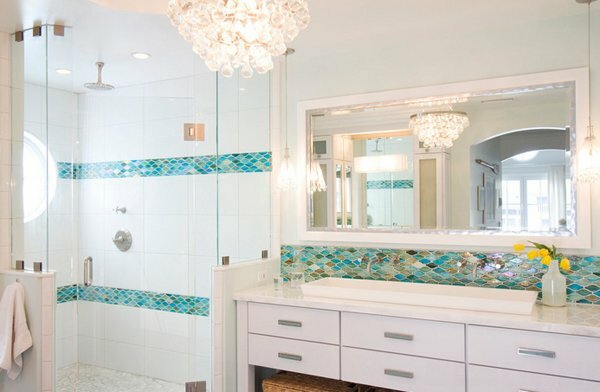 Coastal bathroom with breezy feel and amazing capiz shells chandelier. 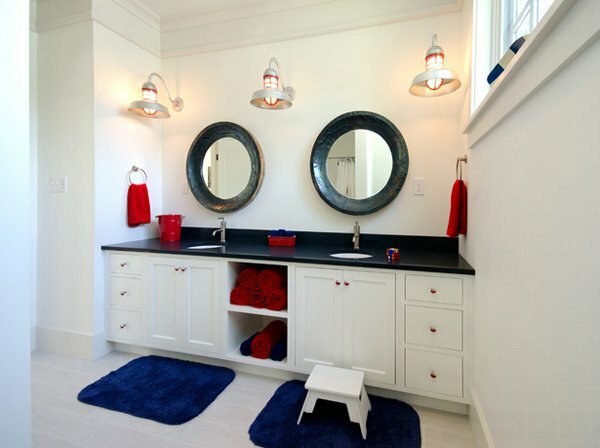 The cabinet configuration of this Boston bathroom is just awesome; plus the mirrors and the industrial lighting is so neat! 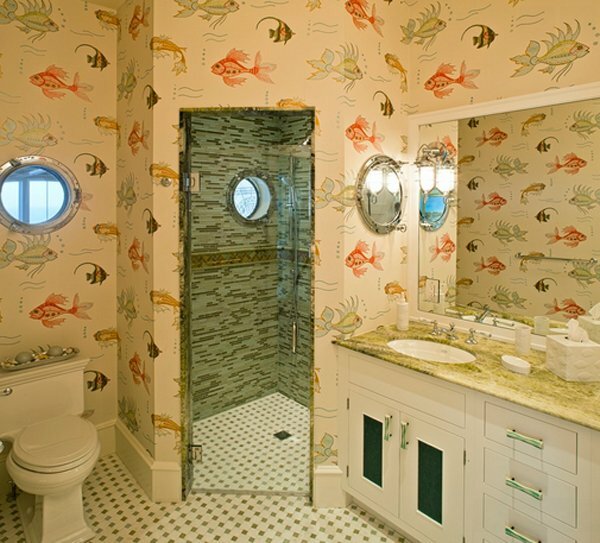 The circular windows of this Philadelphia bathroom is just perfect! 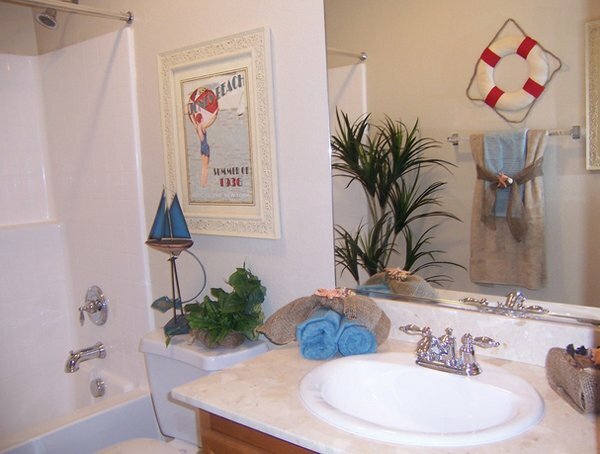 Just look at the seahorse planter and faucet! They’re gorgeous! 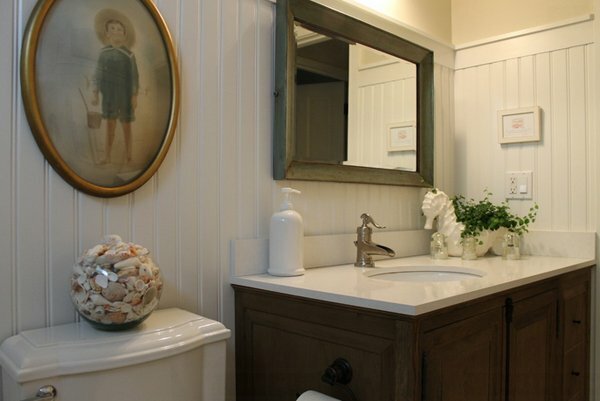 While these sconces are new, they have a vintage barn look. They also pick up on the galvanized tin bucket underneath the vanity. Browse some of our favorite barn light fixtures. The decoration of this Las Vegas bathroom is cute as you can see on the mirror and on the sides. Renovated to accommodate a family of eight, this oceanfront home proudly overlooks the gateway to Marblehead Neck. This renovation preserves and highlights the character and charm of the existing circa 1900 gambrel while providing comfortable living for this large family. 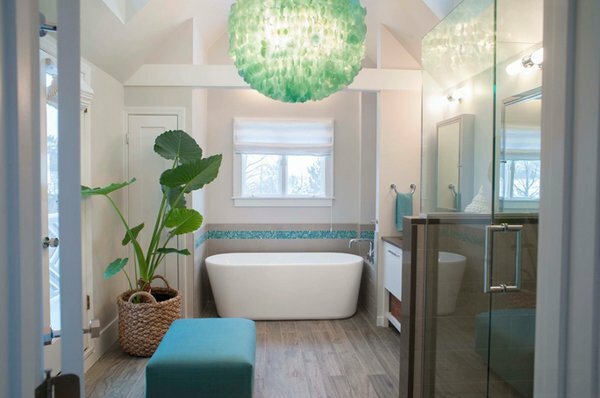 The chandelier light fixture over tub is just stunning! The thought of having two bathroom mirrors is just smart. The ultimate fun weekend for you is finding the best seafood shack for a chowder or walking to the top of a lighthouse. 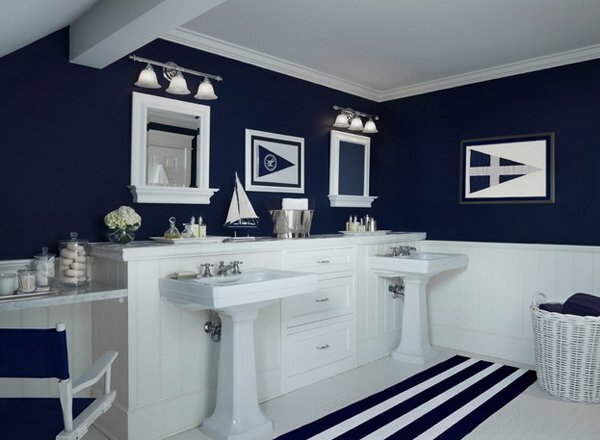 I love the color of this bathroom and the nautical decors added to it. 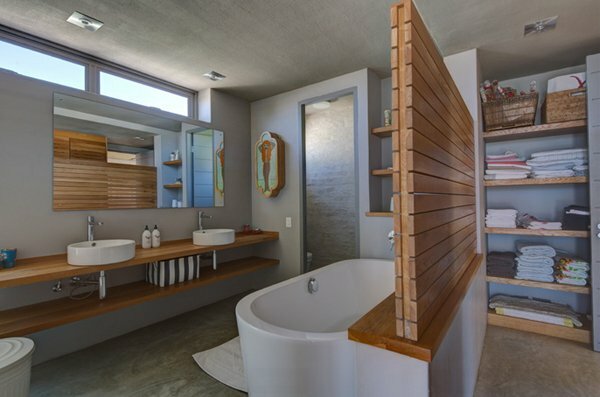 This sand-colored space reminds me of a bathroom seen in hotel resorts to copy the beach. The decor on the walls of turtles are cute. Love the roman shades on the door and the shell pictures on the wall. 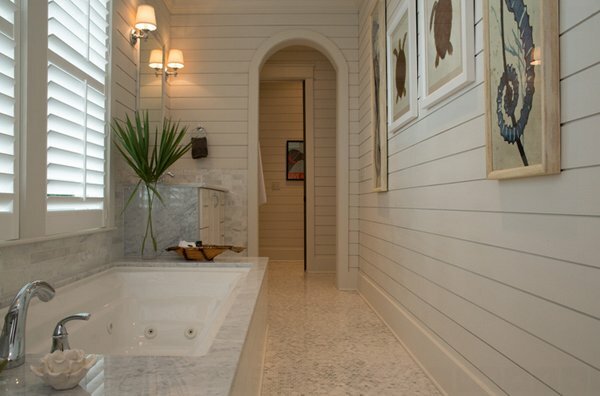 I like the privacy of the wooden frame, which is rustic but also coastal. 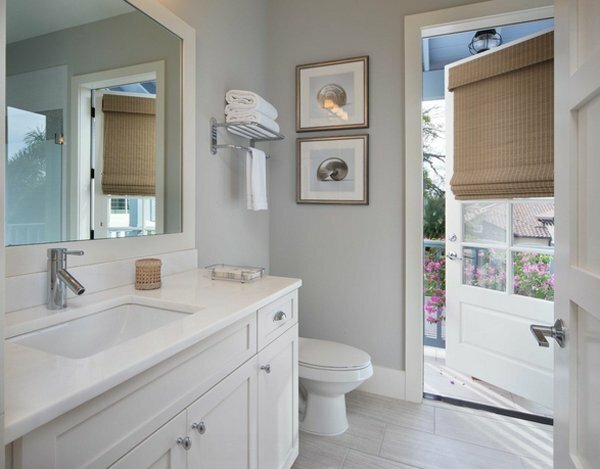 Who says planters are not decorations that you can add on your bathrooms? I just love this plant in an all-white bathroom. 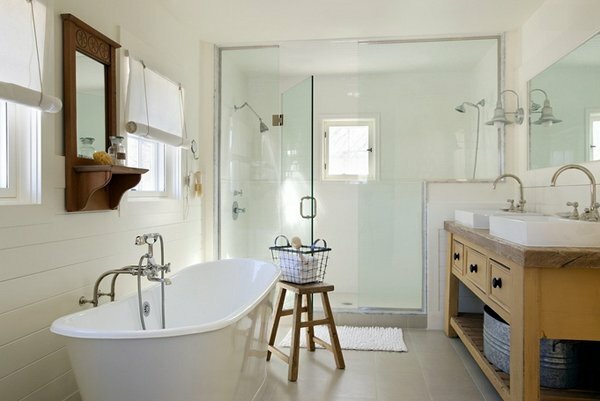 This may seem a simple Providence bathroom but look at the tiny details on the tub – shells in tall jars. The colors in the Moroccan tiles but not the style; but still love the chandelier of this bathroom. 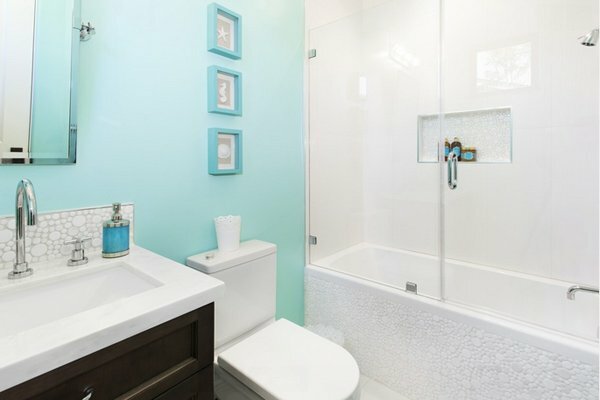 Feminine bathroom with large format white tiles and accent circle tiles. 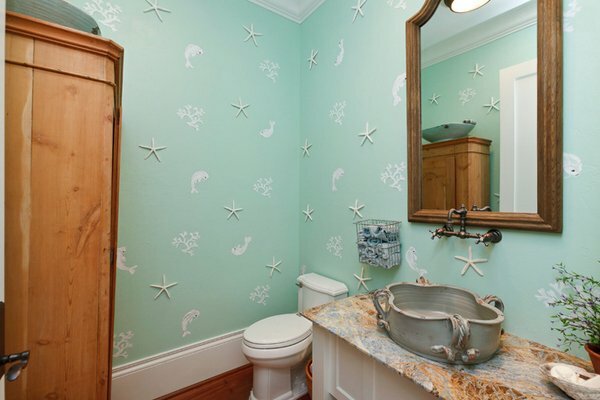 Look at this bathroom again and note the tiny star fishes on the walls and the unique lavatory used here – totally interesting. The beach is one place you can kill time while enjoying yourself with the view – nature and the many different people you get to have an encounter with. Small shells and interesting stones from corals are small trinkets one can collect and use as display in their homes. We hope the pictures above are as inspiring to you as they are to me.